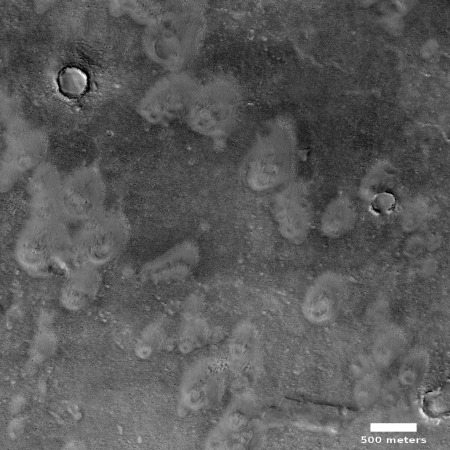 Hmmm, what do impact craters look like that are formed under a few hundred meters of water? Do they form indistinct impressions such as these? The reason almost all impact craters are round, no matter the angle of the impact is because the damage is not caused by the meteorite throwing out ejecta, but by the acctual energy released by the impact… Think a nuclear bomb… If dropped from above or launched in at a low angle on a missile the blast range will still be circular. An impact into water of any significant depth would release it’s kinetic energy upon contact with the water, and whilst it might cause a sunami on the surface it could not create such perfectly formed craters. I’m thinking mud flats or, like on, mud volcanoes …. Mars is a much more interesting place than the Moon. There should be 100+ rovers rolling over Mars – exploring every inch of Mars. How about robots BUILDING and REPAIRING rovers/robots ON Mars?